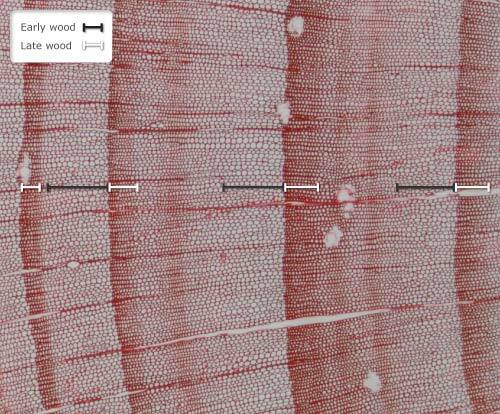 This cross-section of radiata pine trunk, as viewed through a microscope, shows the early wood and late wood in each ring. Early wood is formed in spring and consists of thin-walled cells with a large diameter. Late wood develops in late summer and is made up of thick-walled cells of small diameter. It is the densely packed late wood that makes up the dark rings visible in cross sections of pine stems.